These six great nostalgic-looking steak knives of the brand LAGUIOLE have a rustic-elegant handle made of oak, which is additionally secured with metal pins. The largest metal pin shows an engraving with the trademarks sign of LAGUIOLE: a bee. With the handy knives NOSTALGO, you are no longer annoyed by the badly cuttable meat on your plate: the griilled meat will be cut smoothly from now on - just as you prefer it. 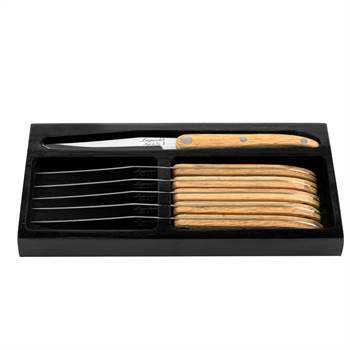 Just try it out and get the beautiful set of steak knives with nostalgic oak handles which comes in a beautiful black-painted wooden box. The chic box is a wonderful way to protect the knives and keep them in order. You would want to rinse the knives by hand only since the wooden parts are not dishwasher-safe. Measurements (approx. ): Length: 9", Blade Length: 4.3"